Every teenage band in the 60\'s knew how hard it was to get a song recorded. You needed an established band, a producer, a manager, a recording studio and engineer, a good song, and lots of money, just to get 7 or 8 parts recorded together into a song. Today\'s songwriters enjoy the convenience of computers, multi-track digital recorders, drum loops, instrument sounds, everything at the touch of a button, to record one track at a time in the comfort of their own home, and whenever they feel inspired to manifest their vision. There was an actual turning point from the 60\'s to now, and that was in 1973 when the Teac 3340S entered the commercial market. At an affordable price, the Teac gave you the same multi-track capabilities as those four track studios of the 60\'s. Another new technology of the time was the Univox drum machine. Together, the Teac and drum machine started the home recording revolution - the complete self containment for songwriters of which is the norm today. One of the earliest examples of this technology is Eric Olson\'s \"Springdale \'73\". 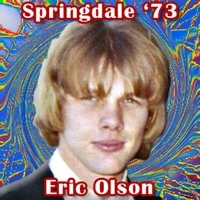 Springdale \'73 by Eric Olson is a catalog of about 30 original songs recorded in a bedroom at Springdale Apartments in Waukesha Wisconsin in 1973. All tracks were recorded one at a time into a Teac 3340s using a Univox drum machine as the foundation, achieving the same basic results as todays songwriters using multi-track digital tools and drum loops. The Teac and drum machine together opened up creative doors for songwriters everywhere. Remastered on a Roland 2400 digital recorder, the twelve songs chosen for this album were based on the diversity of the songs and the drum beats supplied by the drum machine. These very original pop songs and unique recordings are one of a kind, and would be a real novelty as an addendum to your record collection.